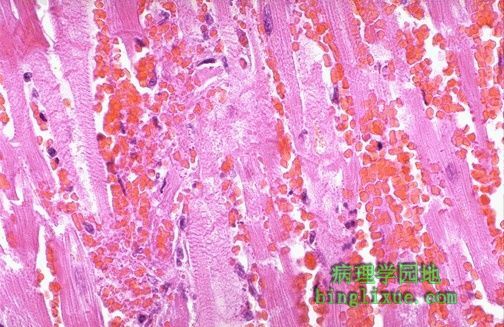 This high power microscopic view of the myocardium demonstrates an infarction of about 1 to 2 days in duration. The myocardial fibers have dark red contraction bands extending across them. 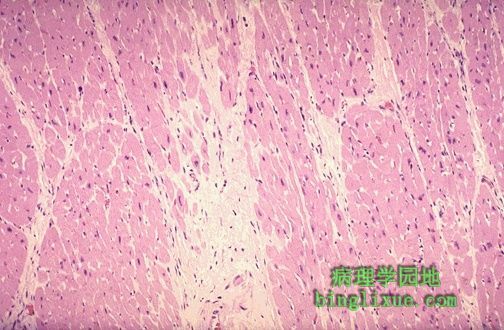 The myocardial cell nuclei have almost all disappeared. There is beginning acute inflammation. Clinically, such an acute myocardial infarction is marked by changes in the electrocardiogram and by a rise in the MB fraction of creatine kinase. 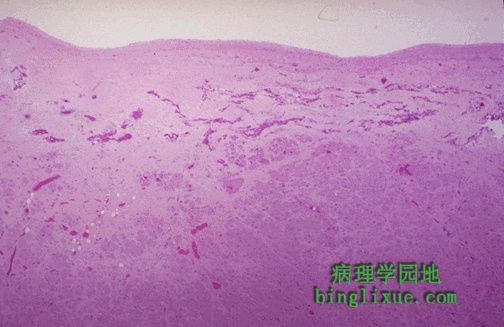 In this microscopic view of a recent myocardial infarction, there is extensive hemorrhage along with myocardial fiber necrosis with contraction bands and loss of nuclei. 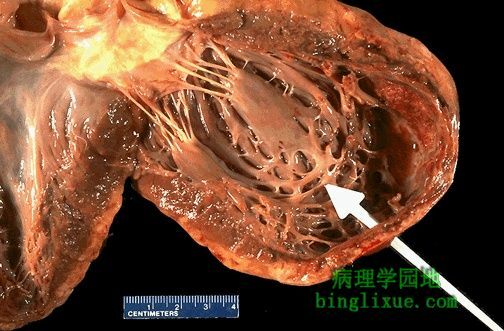 This myocardial infarction is about 3 to 4 days old. 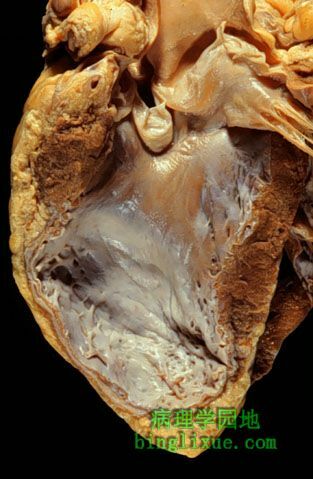 There is an extensive acute inflammatory cell infiltrate and the myocardial fibers are so necrotic that the outlines of them are only barely visible. 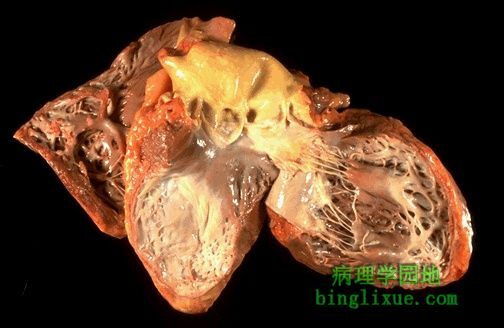 This is an intermediate myocardial infarction of 1 to 2 weeks in age. Note that there are remaining normal myocardial fibers at the top. 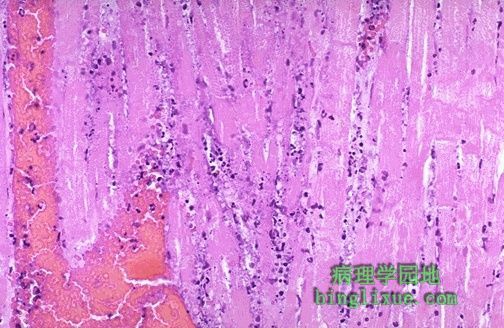 Below these fibers are many macrophages along with numerous capillaries and little collagenization. In cross section, the point of rupture of the myocardium is shown with the arrow. 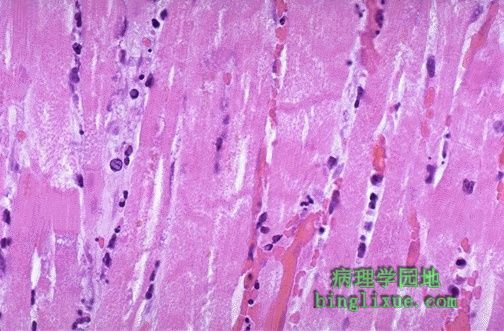 In this case, there was a previous myocardial infarction 3 weeks before, and another myocardial infarction occurred, rupturing through the already thin ventricular wall 3 days later. 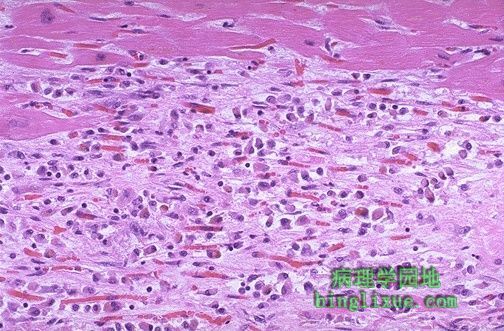 There is pale white collagen within the interstitium between myocardial fibers. This represents an area of remote infarction. 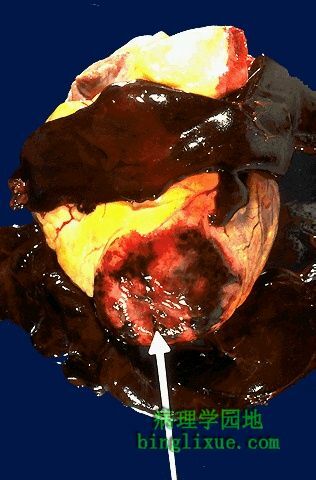 The myocardium beneath the endocardial surface at the top demonstrates pale fibrosis with collagenization following healing of a subendocardial myocardial infarction.